Smith Sustainable Design believes that our clients are our most important source of business. A referral from you is hands down the BEST compliment we can ever receive. Because most of our business comes from the word of mouth, we have decided to thank our customers for spreading the word about our company! Through the Smith Sustainable Design Referral Program, we will reward customers who share the benefits of solar and geothermal system installations and energy audits to their friends and loved ones. Now, having solar and geothermal systems installed in your home will not only save you money, it can also bring you money too! You can get $500 for every referral that goes solar power or geothermal ($250 for solar hot water) through Smith Sustainable Design. When your referral results in a completed sale, the $500 will be yours! 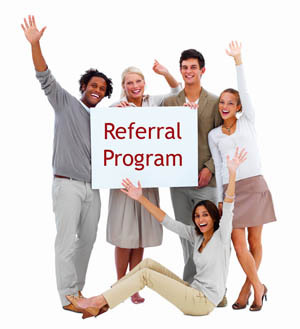 Everyone can join our referral program and there is no limit to the number of referrals a customer can make. What if your referral decides to purchase BOTH solar power and geothermal systems from us? You will be paid double! That’s right. Convince you friend or loved one to have both systems installed and you will be given an amazing amount of $1000. Interested in getting an additional $50 in your wallet? Just refer a friend and when he/she ends up getting an energy audit from us, you will surely receive $50! Just fill in the form in this page or contact us today to find out more. We will pay the referrer a check containing the amount agreed upon after each job is completed.